Less conveniently, flights are available into Long Island's Islip Airport and White Plains Airport. Here is a complete list of airlines servicing the New York City area. Finding an affordable fare to New York City. Learn about the variety of airfares available and the distinctions between them in Fare Talk by About's Air Travel Guide Arlene Fleming. Arlene has also assembled a list of online booking engines to make it easy to book your flight online. The truly frugal might want to try Priceline or Hotwire to get the best fares, however they don't always offer the best deals and it pays to research. I price my fare on Expedia, Travelocity or Orbitz. This gives me a pretty good idea of how much I should be planning to spend. Surprisingly, there can be better prices on one engine or the other and there are often variations in the price over several days or weeks. Fares are almost always better if you stay for a Saturday night, fly Tuesdays, Wednesdays or Thursdays, are willing to change planes and/or fly early in the morning or late at night. Depending on the flexibility of your plans, consider these options when searching for fares. Consider airports slightly further away from your home if you're really budget conscious. 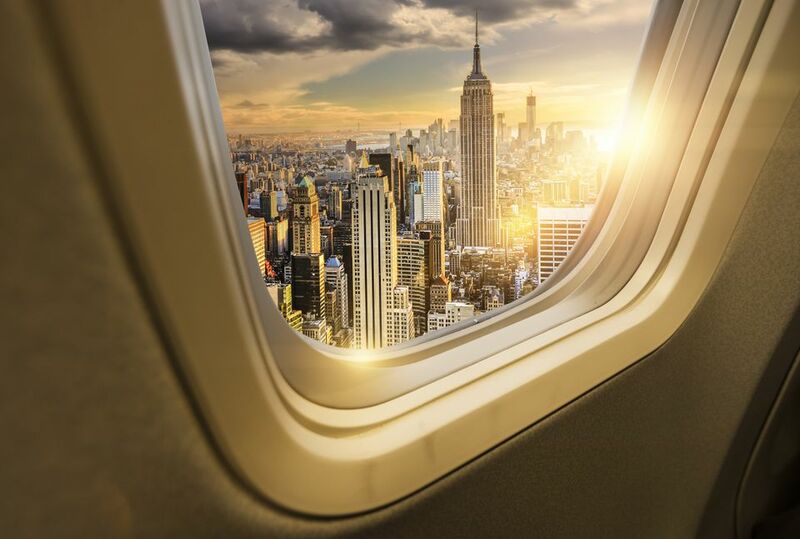 Definitely consider flights into any of New York City's three major airports (LGA, JFK, and EWR), as they are all convenient if Manhattan is your final destination. Make a note of the best fare (or two) available on each service. Next, I check Hotwire's fares. Unless my vacation is pretty long or I'm really trying to stick to a budget, I prefer not to book with Hotwire, because you have no idea what time your flights will be on a particular day and often services like Priceline and Hotwire put you on a very early morning or very late flight. Early morning flights to your destination present a problem when you are hoping to work during all or part of a day before departure or for returning, it can result in effectively losing a day in your destination. Likewise, late night flights can mean you miss out on a day in your destination upon departure. Essentially, this can result in up to two days less time at your destination, and the savings can easily be lost in having to pay for a night in your hotel while you end up with a day less in New York City. Also, I often see better fares on the major fare booking engines. Regardless, Hotwire's bid gives me the possibility of seeing a lower fare "goal." LaGuardia Airport is home to AirTran, Frontier, and Spirit. John F. Kennedy Airport is home to Jet Blue, Sun Country. Newark Airport is home to AirTran and Midwest Airlines. For destinations other than New York City, try Fly Budget for links to the lists of airlines serving each airport. Next, I check smaller flight search engines, particularly Kayak. With all of this information, I generally wait a week or so and re-check the fares before making a purchasing decision. If I'm feeling bold and flexible, I'll make a bid of about 20-30% less than the lowest fare I've found and give Priceline a try.